Life is like a snowball. A flying ball of ice smacks you in the side of the head, and as you snap in the direction of its origin, splat! Another one hits you right between the eyes. But life is also like a peaceful Mediterranean cruise, with soft morning breezes and moonlit nights. As you reflect back on 2017, which of these would describe your life? Maybe most of us would claim both. The only thing we know for certain is that God was working out his will in our lives—in the snowballs leaving us stunned and the cruises leaving us rested—all for our good and his glory. How did you do with last year’s resolutions? Did you complete you Bible reading plan? In case you’re looking for a 2018 plan, you will find many posted here. They’re all a little different but good and profitable in their own way. I have many wonderful memories planted in 2017, the 500th anniversary of the Reformation. The celebrating really began early in the year with so many articles, lectures, sermons, books, and conferences. 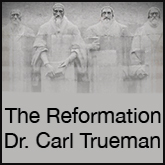 I’m still reading Carl Trueman’s work on Luther, which has opened up estuaries of thought that I’m sure will lead to other areas of study in 2018. Last week I took a little time to reflect on Jonathan Edwards’ resolves. Have you ever read them? If not, you will find them here. They can leave you feeling like the man landed from another planet. But after the initial effect, they begin to inch their way into your thinking and then wiggle down into your heart. Before you know it, they’re popping up at the strangest times, such as when your mind wanders while your pastor is preaching his heart out (see Resolution 5), or when you get into an argument with your spouse (see Resolution 15). They just stick around like mental velcro. As I look forward, wondering what 2018 will look like, there’s one thing I know. It will bring suffering and rejection my way and probably your way as well. Are we not following the One who suffered and was rejected? The new year will find followers of Jesus on the road of the cross, a place from which we never return, a march to self-denial and self-death. This is the call of the Gospel. “If anyone would come after me, let him deny himself and take up his cross and follow me.” (Matthew 16:24) I hope we’ll be traveling this road together. And I know one more thing. 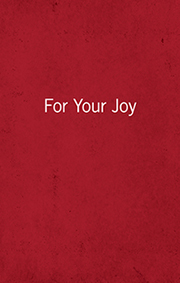 Our hearts will be filled with joy, the kind of joy that can’t be quenched by our circumstances whatever they may be. For the time being, we live in this already-not yet state where we are sorrowful yet always rejoicing, and that will be the case until we live out the number of days God has ordained for us, good days filled with love and useful service in the kingdom of Christ. Happy New Year. May God’s rich spiritual blessings rain on you in 2018.